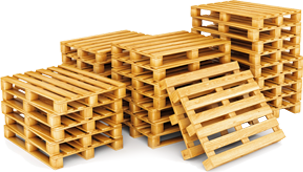 Pallet Renew rents pallets for short-term or long-term rental periods. Our inventory is monitored to ensure various types of production-ready pallets are available on-site for immediate use. Leasing is similar to renting, except that the cost of leased pallets remain constant throughout the duration of the lease. This consistency of cost protects you from cost inflation and helps with long term budgeting. Both leasing and renting provide certain advantages that may be preferable to buying, depending on the nature of your business.